Ebenezer Scrooge only loves one thing, and that’s money. He hates anything that brings cheer and happiness to others, so he naturally despises the whole Christmas season. One Christmas Eve, Scrooge is visited by his dead partner, Jacob Marley. Marley has been dead for years and was just as selfish as Scrooge. His spirit is now forced to wander the earth in chains, and has come to warn Scrooge that the same fate awaits him if he continues living the way he has been. Three spirits are going to visit Scrooge: the ghosts of Christmas Past, Christmas Present and Christmas Yet to Come. As Scrooge is given the chance to wander through his past and future, he comes to see himself in the same way that others see him. If you’re going to read one holiday related book this Christmas, then make it A Christmas Carol. I’m quite certain that everyone is familiar with this story. Even if you haven’t seen the film, so many TV shows have done A Christmas Carol themed episodes that everyone knows the tale of Scrooge and the three ghosts. Like most people, I am very familiar with the plot and have seen many adaptations, from Mickey Mouse to Doctor Who. Because of this, it didn’t hit me until midway through how original and genius the idea behind this story is. I’ve seen so many retellings that I momentarily forgot that someone actually dreamed this story up. I love the style of narration, the plot, the overall message and how the story presents the festivity of Christmas. This novella is an allegory about poverty in Victorian London, with the infamous Scrooge representing the greed of the rich. 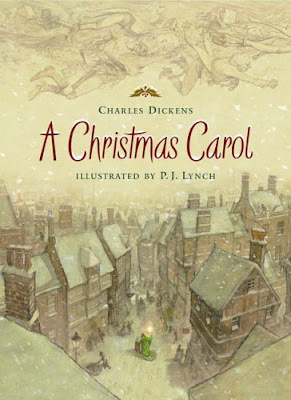 A Christmas Carol is very short and could be a good introduction to Charles Dickens. While it’s not his best work, it does capture a lot of the great things about his writing, while being short and easy to understand. As a Christmas story, this is as good as it gets. There are so many retellings for a reason: A Christmas Carol is a timeless story that captures the spirit of the holidays. No matter how many movie adaptations you’ve seen, the book has a special magic that will make you feel like you’re learning of Scrooge’s redemption for the first time. I love this book. I just finished it, today a day before christmas#christmas eve. I have to say i loved it!